Thanksgiving, already!? I swear, if it weren’t for the Canadian Thanksgiving being in October, the thought of planning my menu would pass right on by in my head. So, a special thank you to my Canadian friends for always providing that reminder. Thanksgiving last year was a little bit crazy. As in, I hosted for 20ish people in my 1200 square foot apartment where I have a pub style dining table that seats four. We did bring in a long folding table and chairs so there was some additional seating, but it was only enough for half of us to sit. I think I may have sat on the floor to eat. It was also a complete whirlwind of an event. With that many people, there was a ton of food and I spent more time working on the food than I did spending time with everyone. I’d prefer not to go that route this time and I’ve tried really, really hard to limit the amount of food I’m going to make. My guest count is still up in the air. My cousin is due on December 6th and no one thinks she’s giving birth anywhere near her due date and will end up much earlier. If that happens, I’ll be down 4-5 adults and a toddler. I’ve also spent a lot of time watching Ina Garten on the weekends in hopes that her simple but fancy appetizers and very laid back party planning will rub off on me. I’ll let you know how it goes. I haven’t spoken to my other aunt yet to see what she plans on making, so this is subject to change, slightly. It’s still way too much food for the amount of people that will probably show up, but it is actually cut down over the previous years. The cashews and cranberry sauce can be made far in advance. Almost everything else will be made the day before so Thanksgiving will really be about cooking, re-heating and plating. And guess what else! You can have a free printable! Remember the other week or so when I mentioned internet friends? Well one of them is starting her own printables business and emailed me to see if I’d be willing to share her printables on my blog. Of course I said yes and the timing was perfect. 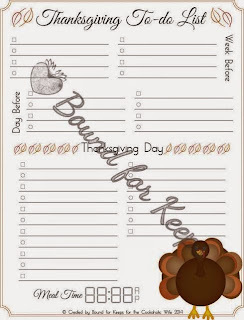 She made a Thanksgiving To-Do list for you! Look at that turkey! Isn’t he adorable?! To print a copy without the watermark, simply click here. Guess what else — I’ll have more printables to share with you in the very near future!